This year I will be making a 3 tiered wedding cake. No no, it’s not for me, it’s for my market stall friend Sue’s daughter. The wedding is in May, so it is plenty of time ahead, but being of a slightly panicky character, I’ve been thinking about it rather a lot – I just had to get the test bake done to rest my mind by knowing what is involved. A wedding cake must be Perfect with a capital P, no slip ups allowed, & certainly not a sorry ‘leaning tower of Pisa’. The design came about after intensively conversing with the client. The brief from the onset was to create a chocolate wedding cake. Chocolate, totally my forte! Additional specs were for it to be simple, no fancy decoration, & to fit on top of a 12 inch cake stand they wish to use. Oh, & it has to travel to Wales! The result was this. A chocolate pound cake with raspberry & dark ganache layers, covered with white chocolate glacage. There are white couverture chocolate rectangles stuck all around the side. The rectangular slats are super shiny as it is hand-tempered. 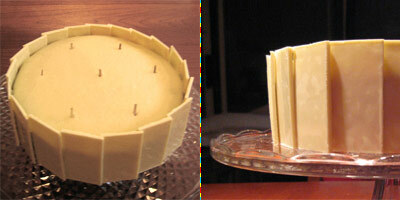 The advantage of doing slats is that the cake can be neatly cut in to equal pieces when plating out to the guests. Also, I can make these slats well in advance, which would take the pressure off a great deal. I’m going to supply extra slats as reserves, just incase some snap on journey to Wales – although I really think it’ll be okay because I will be making these slats rather thick. Each tier will be supplied in seperate boxes, for safer transport. They will then have to stack it up on location themselves. Each tier will be balancing on the wooden plinths poked in to the cake (as in the picture above) which is very snugly secure. – Like how on conception, I was invisaging a ribbon around each tier to keep the slats bound together – but now I know that the glacage acts really well as a ‘glue’ to hold the slats in place & it’s pretty solid. I tried a ribbon around it, & it just took away the beautiful simplicity from it all. – Another lesson was that it was difficult to cut it in to pieces because the slats were overlapping each other & I could not run the knife down unless I brake the slats in to pieces. So I must not overlap, which is a shame, I really like it as is. I’m afraid that if it were just jutting next to each other there will be inevitable & ugly gaps appearing. I need to work on a solution for that. This week I’m in a right old moany mood. Hope Issey is feeling better!? We went to the market on Saturday and where looking for you. When are you restarting your stall again? We’re also having the same problem of not having enough good paediatricians here in Japan. With the birth rate decreasing, something has to be done soon to improve the situation or else parents will be too scared to have children at all. As for the wedding cake…Wow! It’s truly elegant and chic! Sooo professional.I bet it tastes delicious too. I wish I could say, save me a bite..
As well as the shortage of paediatricians, I really thought that the place was badly organised. Patients were left waiting around not knowing when they’ll get seen (ill or hurt, suffering without treatment – is it gonna be 30 minutes or hours? ), creating a worried feeling of being forgotten. Many were stopping the staff to ask (often in a impatient manner), which only slowed their work. – Next time you’re in Ldn, I’ll bake you cakes! sorry to hear about i. I hope he’s feeling better, see you at nursery tomorrow mayb e ? hi nikki! nursery starts at 1.30 for him just for the first day, rather than 1. – so that the teachers have time to settle in the other kids before he comes. Are you gonna be at playgroup tomorrow?